¿Hablas español? 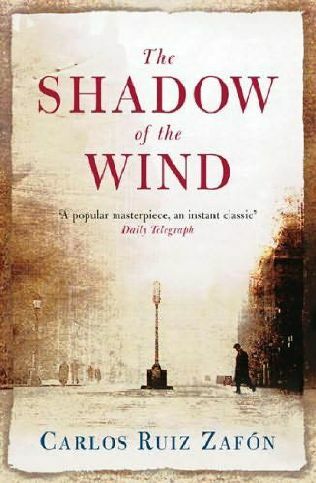 If you do, you should probably read The Shadow of the Wind by Carlos Ruiz Zafón in its original Spanish. Boyf did, but I read it in English. I suppose I would call this book a mystery based on the definition of the word rather than on the general idea of the genre. This is not a "whodunit"-type story. It is intrigue and family and heartbreak and inspiration. I can hardly resist a story about words, and this one starts with the description of The Cemetery of Forgotten Books. It takes place mainly in Barcelona, which is interesting given that Catalan, and not Spanish, is the language of the region. It was especially exciting to read this book the first time around, as I had just been to Barcelona a couple of months before. Have I ever told you all that I studied abroad in England? I did, and my last trip from Canterbury (where I lived and went to school) was to Barcelona. The trip itself was incredible and beautiful, the art and life of the city breathtaking. I fell in love with everything Gaudi created, and could spend all day wandering around his whimsical city. Reading a book set in such a magical place, told in such gorgeous, mesmerizing ways was a fabulous experience. There are a few characters of this book that I cannot believe are merely fiction, and I count their stories as history. This story does a beautiful job of showing a person as multifaceted; what you are today is not what you were yesterday. It's hard to recognize that in everyday life, but impossible not to notice in Zafón's masterpiece. The book has also got a fair bit of romance in it, and what beverage is more romantic than wine? I'm giving the wine a bit of a Spanish twist in the form of sangria. In a word? Yum. In two words? More, please. And in three? It gets better. My mom and I made a few batches of this a while back, and kept the leftovers in a plastic pitcher in the fridge. It tasted better every night, growing more and more colorful from the fruit until the last glass I drank was a warm, peachy orange. This is going to be another recipe without measurements, because I trust you all to know what you like. Want more citrus? Slice up another lime. Need a little more kick? Pour a more generous serving of brandy. Feeling like you need a bit more refreshment? Try some slices of cucumber! I bet that'd be delicious. 1. Slice all the fruit. It's prettier if you keep the slices all looking nice, but no one's going to complain about an imperfect slice in their glass. 2. Pour a bottle of wine into a pitcher, as well as a generous shot or three of brandy. 3. Put all the fruit into the pitcher. 4. Let it chill for at least a couple of hours; even better, let it sit in your fridge overnight! But be sure to cover it so it doesn't taste like refrigerator. This sangria is best enjoyed with some tapas and a good book.